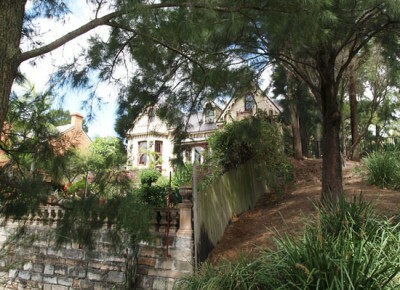 Thornley was one of the most active architects in Glebe during the 1870s. Solling notes that in a period of just over 20 years, Thornley had called tenders on about 100 buildings, including houses, villas, cottages, corner shops, etc. He built and lived in the Picturesque Gothic Florence Villa (1873-6). Most notably, however, he will be remembered as the architect of Glebe Town Hall (1879-80) in St Johns Road. However, the economic depression of the 1890s caught up with Thornley and he was declared bankrupt in 1895. Thornley’s output also included the former Gresham Hotel, Corner of York and Druitt Streets (1890-94) which from the George Street intersection, sits visually and harmoniously (if on a rather smaller scale) between the Town Hall and the Queen Victoria Building (QVB). On the Early Glebe Architects walk, Thornley’s legacy in Glebe can be seen in Bellevue and Glebe Town Hall.